You unpack your shiny new crash helmet, place it on the work bench in your garage and stare at it lovingly. Returning a few minutes later with a hot cup of coffee you’re horrified to see it rolling around the floor with scratch marks and a cracked visor. Your pet cat running down the garden is a distant spec. Your crash helmet is probably safest when resting on your head but away from it hidden dangers lurk everywhere. Protecting your crash helmet is more than just preserving cosmetic appearances. 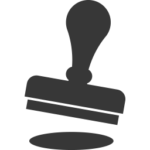 Even minor damage can weaken its structure and lead to serious injury or death. A motorcycle helmet bag not only protects your helmet, it’s also a convenient carrying device. Tucked under your arm a crash helmet can be scratched against doors, the studs and zippers of your riding jacket or get knocked to the floor by wayward passersby. Give your helmet a long, safe and scratch-free life by purchasing a protective bag. Good solid bag, the Lidstash offers the best balance of quality and value. You get an outer pocket which doubles as extra padding and two carrying options which allows for great flexibility. Before buying a helmet bag consider what happens to your helmet when you’re not wearing it. Is it stored in a vulnerable place? Is it exposed to hazardous or corrosive materials? Can people, objects or animals damage it with accidental contact? Will the weather and environment affect your helmet? A hands-free carrying option allows you the mobility to go about your business while protecting your helmet from knocks or theft. Looping it under your arm or resting it on the mirror stand will deteriorate it over time. And where does the protective bag go when you’re wearing your helmet? Do you really need a ‘bag for your bag’? Does the bag also include pockets, pouches and zippers for those extra accessories like gloves, head scarfs and wallets? Can you carry it comfortably or wear it as a backpack? With helmet protection in mind then a soft lining is a must. Look for an interior that won’t cause an abrasive ‘rub’. It’s not just the material texture that’s important but the possibility of your helmet moving around inside the bag. A compact and securely enclosed fit will prevent that. Side pockets also provide additional storage and waterproofing prevents moisture from entering the helmet lining. We all know that helmets become hot and sweaty after long rides especially in the summer. Check for adequate ventilation points when choosing a bag and avoid storing it in hot places especially straight after use. A bag that both protects your helmet and is collapsible and foldable will allow you to store it within your machine when on the road. 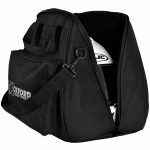 The Oxford Lidstash Helmet Bag protects the outer surface of your helmet with its fleece-lined inner fabric. A generous outer pouch bag allows additional storage of accessories. Also in the budget bracket it provides a lot of bag for your money. Can’t be used as a back pack. The MOTOGP Messenger bag is a simple zip-up helmet carrying bag with an adjustable shoulder strap. It’s ideal for those who want a low cost method for carrying a spare helmet for passengers. No frills… just a bag with a strap and cheap as chips. 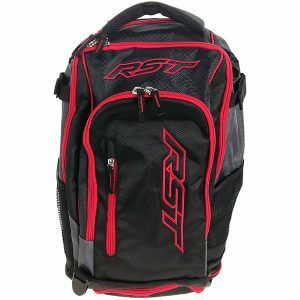 The RST Premium Rucksack and Helmet Bag is a stylish, black and red, elasticated back-pack with a zipped helmet pouch and chest retention straps. The idea is good and represents two bags for one price. The main rucksack has a generous amount of room. The separately attached helmet bag is large enough to hold a full-face Arai helmet. There’s one consideration: if you want to carry the helmet bag alone, just the carry handles remain once it’s detached from the main rucksack. The good news is that the helmet bag, when not in use, fits easily onto or into the main bag provided it’s not already full with riding accessories… or shopping! 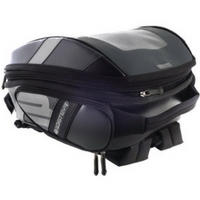 The R&G Racing Deluxe Helmet Bag is described as tough and durable yet flexible enough to stow under a rider’s seat. There are two carrying options: either sling it over your shoulder using the adjustable strap or choose the fixed carrying handles. 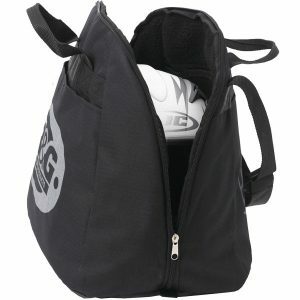 While described as a helmet protection bag its unique features make it an ideal travel or flight bag. It can be had pretty cheap so it represents good value too. I like the Oxford Lidstash helmet bag the best. The outer pocket provides an additional layer of protection to the exposed area when placed against a wall or on a shelf. The pocket also allows quick retrieval of items and a separation from the helmet’s outer surface. With two carrying options it gives a hands-free trip around the motorcycle show where you can play with the controls of your next new bike! While superior in quality, design and specifications, the RST two-in one option is more than I need but if the extra carrying capacity is your priority then this is a safe and efficient way to go. My second choice is the simple Moto GP bag. Anything other than my helmet can go in pockets or the glove compartment. Without the helmet it is small and flexible enough to be worn or stowed almost anywhere. Solo riders will likely use it to carry and store when not riding their bike. If you have a long walking commute from the car park to the office or stow your helmet in a vulnerable place between rides then something with a greater protective lining is a must. Dropping a helmet from height or exposing it to heavy impacts is another matter. Only a hard-shell casing would fully protect it. 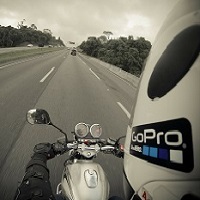 Riders who carry a pillion passenger may wish to carry their crash helmets after dropping the passenger off. In the absence of panniers or other means of stowage then a shoulder strapped bag would be required. 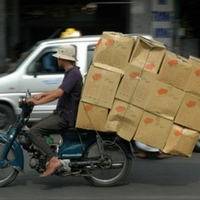 In any event the bag shouldn’t move around, distract or hinder the rider from riding or pose a safety issue to others.